It's much cooler than yesterday. Dress warmly. Well, the Fall 2011 season has flown by so quickly. We've been to Sterling and Somerville, Pepperell and Portsmouth, Groton and Greenville, the list goes on and on. Anyway, Monday, November 21st is the last official day of our season. If we get some good riding weather after Thanksgiving, we may do some special rides. The morning ride will travel to the rapids on the Nashua River in Hollis, NH. The Nashua River Rail Trail is still closed, so we will ride through Dunstable and a piece of Nashua to get there. The backroads through Dunstable and Pepperell are very peaceful and scenic and I don't think we will miss the NRRT. The morning ride is the easier of the two rides with about 14 miles and 200 feet elevation gain. The afternoon ride will feature a bunch of newly resurfaced roads on our way to Beaver Brook Association in Hollis and then on to quaint Hollis Center. From there it is almost all fresh asphalt back to Pepperell Center. There are some very nice views on this ride, but as you can imagine, that means there are some hills. The route is almost 16 miles and 400 feet elevation gain. Route Map - Pepperell - Nashua River Rapids - No NRRT. Equipment - I am planning to bring my road bike. AR Index = Roughly 15 flat, smooth miles. We will have lunch at the NEW Pepperell Spa Cafe. The food is about the same, but the bathroom is truly a thing of beauty! Rough Surface - 1.5 miles freshly graded dirt / gravel road - very smooth. AR Index = Roughly 20 flat, smooth miles. It's already above freezing! Dress warmly. Get out your woolies, its gonna be cold tomorrow. The forecast calls for BRIGHT BLUE SUNNY skies tomorrow, but it will only be in the upper 30s when we start and mid 40s when we get back. The wind will be busy too, with windchill temps from the low to mid 30s. Bundle up! There was a PortaPotty at the parking lot when I checked yesterday. Bower's Spring is about 3 miles South of Harvard Center on Bolton Road. Just after you cross into Bolton, Flanagan Road will be on your right. We will ride along the ridge taking in some wonderful mountain views on our way to Berlin. More views await us on the way back. There will be enough hills to keep us warm along the way. The Fitness Ride will leave at 9:30 AM. We will return by 12:30 PM. Starting Point Map - Bower's Spring (On the Harvard - Bolton line). Route Map - Harvard Hills from Bower's Spring. Elevation Gain = 600 feet (more difficult). AR Index = Roughly equal to 29 flat, smooth miles. Well, the weather is being uncooperative again. The forecast calls for a 60% chance of rain pretty much all day long tomorrow. I'll make the GO / STOP decision before 8:00 AM. For those of you who have ridden the Mass Central Rail Trail around Sterling and West Boyleston, you know how beautiful it is. Now imagine continuing almost to Barre on the same trail. Its so nice in fact, that we will return on the trail as far as Rutland. We will have lunch at the NEW Heavy Evie's Happy Kitchen in Rutland. Lunch is at mile 20 and if people prefer to get back earlier, I can provide some simple directions and a map. You will still see Altavista Farm and the bison and zoom mostly downhill back to Jefferson. The Exploration Ride will leave at 10:00 AM. We will return by 2:30 PM, or 1:30 PM if you skip lunch. Route Map - Jefferson - MCRT - Heavy Evies. Elevation Gain = 950 feet (challenging). Unpaved = 14 miles (smooth crushed rock). Equipment = Any sturdy, well maintained bike will work. I am planning to bring my hybrid bike. AR Index = Roughly equal to 33 flat, paved miles. The weather forecast just isn't nice enough to do a special ride tomorrow. Cloudy, windy and cold would be too much of a shock to my system after the first 3 days this week! I attached a picture from yesterday's ride to Portsmouth. Other than the inevitable sea breeze on the way back, it was a perfect day. It looks like a FANTASTIC day for bicycling tomorrow. Sunny, mid 50s to low 60s, and very little wind! We have several people on tight schedules tomorrow, so please be ready to LEAVE Hampton North Beach at 10:00 AM. To keep to our schedule we need to ride at a deliberate pace, somewhere in the 12 - 14 MPH range. I promise not to zoom off like I did on the Seacoast Century this year. Most of the morning ride is on Route 1A which isn't very "chat friendly" anyway, so by riding faster we can have more leisurely breaks and not feel rushed. After lunch we have 12 miles back to the starting point and some less busy backroads. We can meet at Shaw's in Groton to carpool at 8:45 AM. Here is a map. 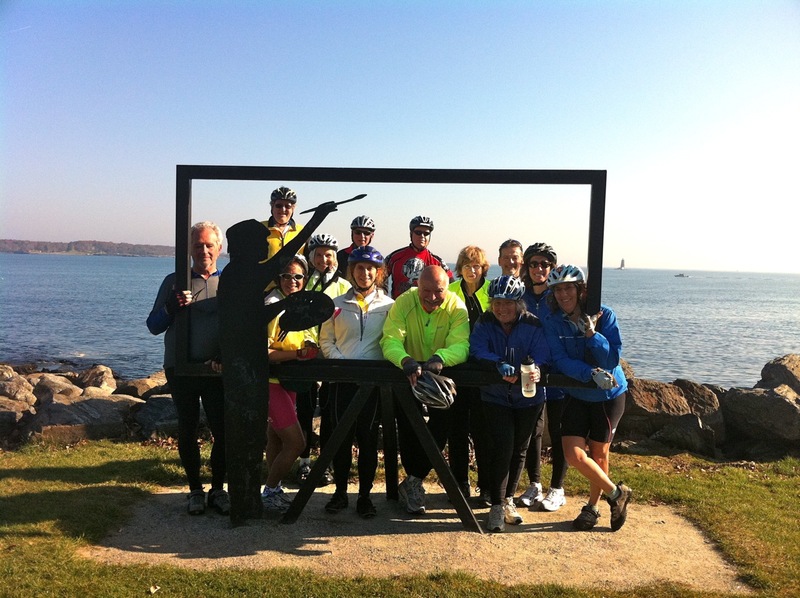 The Exploration Ride will leave Hampton North Beach at 10:00 AM. Here is a map. We will return to Hampton North Beach by 2:30 PM. Starting Point - Hampton North Beach (not to be confused with North Hampton Beach!). Route Map - Hampton North Beach to Portsmouth. Elevation Gain = 310 feet (basically flat). Equipment - I plan to bring my real road bike. AR Index = Roughly equal to 31 flat, smooth miles. I have at least one taker for the Mass Central Rail Trail ride tomorrow, so its ON. The weather today was pretty much perfect for bicycling and tomorrow looks like a replay. We will have lunch at the NEW Heavy Evie's Diner in Rutland. Lunch is at mile 20 and if people prefer to get back earlier, I can provide some simple directions and a map. You will still see Altavista Farm and the bison and zoom mostly downhill back to Jefferson. The REAL Exploration Ride will leave at 10:00 AM. Equipment = Any sturdy, well maintained bike will work, but there could be patches of SNOW. I am planning to bring my hybrid bike. Sorry to bombard you with email, but the next 3 days are looking FANTASTIC! How 'bout a REAL Exploration ADVENTURide on Tuesday (as well as the "regular" Exploration Ride on Wednesday)? I was out exploring this afternoon around Rutland and the Mass Central Rail Trail expecting an impassible mess, but the trail is mostly clear of snow and there are only a few branches down. It starts to get worse by the time you get to Oakham, but that is only 1 1/2 miles short of my intended turn around point anyway. RSVP if you are interested. The good news is that the weather forecast looks FANTASTIC for Monday! Sunny skies, 40s to start the day and near 60 in the afternoon with little wind. The bad news is that the PortaPotties are starting to disappear for the season. We will meet in a little park just north of the Carlisle Center rotary (the PortaPotty at Fern's is gone). Here is a map. Please DO NOT park at Fern's. If the parking lot is full, there is another parking lot at Carlisle Town Hall just around the corner. The morning ride will feature a visit to Heart Pond (also missing their PortaPotty) on our way to Great Brook Farm State Park (and their first class porcelain). After our rest stop, we will explore the back roads of Carlisle on our way back to the Center. The afternoon ride will zoom down to the Olde North Bridge in Concord. There is also first class porcelain at the Visitor's Center for our afternoon rest stop. Then we will ride the back roads of Concord, Acton, and Carlisle on the way back. Starting Point - Carlisle Center. Elevation Gain = 260 feet. AR Index = Roughly equal to 16 flat, smooth miles. Lunch will be at Fern's Country Store at 11:30 AM. Here is their menu. We will have a picnic on their patio. Elevation Gain = 300 feet (more difficult). AR Index = Roughly equal to 18 flat, smooth miles. No official ride. If the weather is nice (it doesn't look that way at this point), I will probably come up with a ride. We had a very nice ride to Somerville today, and yes, some of us did have lunch outside in the beautiful sunshine. Anyhow, if you believe the weatherman, the first part of next week will feature the return of Indian Summer. So, we are planning to do the NH Seacoast Ride to Portsmouth on Wednesday. I wanted to get the word out early so people can plan accordingly. I even attached a picture from New Castle to entice you. On Monday we will do our usual Recreation Rides in the morning and afternoon with lunch at Fern's Country Store in Carlisle. I haven't finished planning the rides yet, but I will send out details this weekend. We will return to Hampton North Beach by 3:00 PM. Bring your warm stuff, it will be windy coming back. I'm sorry to keep changing the plans, but the weather just hasn't been cooperating with me! I scouted the "Harvard Hills" route this afternoon, and between the snow, tree limbs, and downed power lines, it just doesn't seem like a good idea. The Minuteman Bikeway from Bedford to Somerville is in pretty good shape. We can use a modified Friday sort of schedule, where people who want to stop for lunch at Dave's Fresh Pasta in Davis Square can enjoy a sidewalk picnic (if its warm enough), and people who need to get back early can turn around at Alewife. The weather for tomorrow looks Sunny, but Windier and Chillier than today. It should be low 40s and a tail wind going in. In the afternoon it will be upper 40s and a head wind going back. Note the 10:00 AM starting time. BTW, the bathrooms at the starting point parking lot were open today, but there are no guarantees. The route is about 22 miles, all paved, and essentially flat. Its a good way to rack up some miles without killing ourselves, and we get delicious sandwiches from Dave's Fresh Pasta. On Friday, November 4th, we will meet in Bedford at the Minuteman Bikeway Parking. At 10:00 AM - The Fitness Ride will leave from the Minuteman Rail Trail Parking in Bedford. Here is a map. If you're stuck in a cold, dark house, come ride with us to Portsmouth along the beautiful NH Seacoast. The SUNSHINE will do you good! 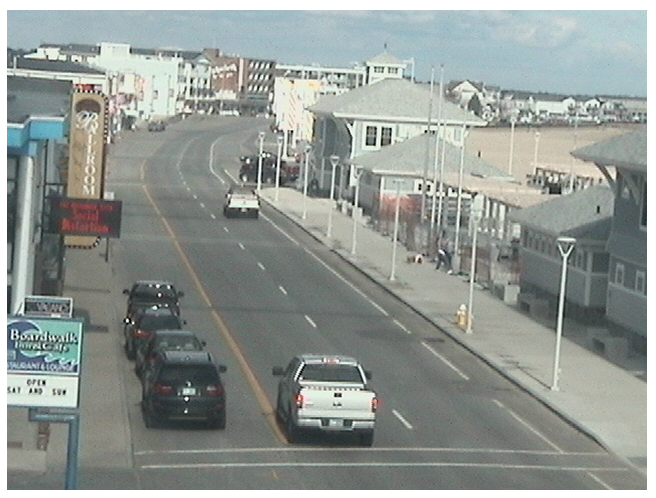 I attached a picture from the Hampton Beach webcam today. As you can see, it is still Fall there. The forecast for Portsmouth calls for SUNNY, almost no wind, and 40 degrees to begin and 50 when we get back. Not bad for November! Although its an hour drive each way, this is a good route to accumulate miles without hills and with marvelous scenery. We won't have to pay for parking or entrance fees, and there's NO SNOW at the coast. RSVP if you are planning to come with us. We can meet at Shaw's in Groton to carpool, or meet at Hampton North Beach. We can meet at the Shaw's parking lot at 4 corners in Groton to carpool. Here is a meeting place map. We will meet at the Hampton North Beach Parking. Here is a starting point map. 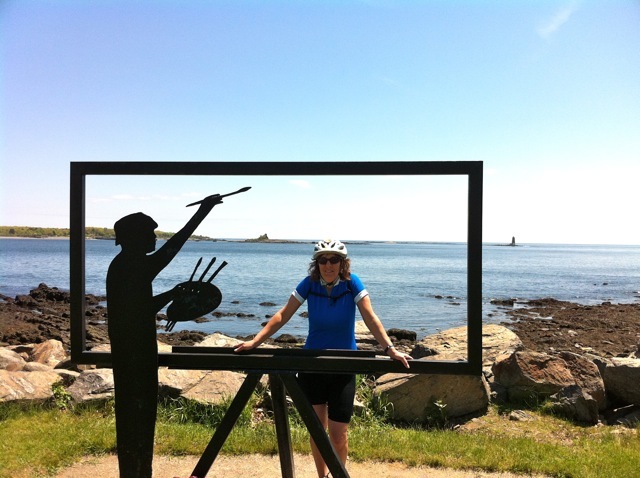 The Exploration Ride will ride along the beautiful NH seacoast to New Castle and then to Portsmouth. 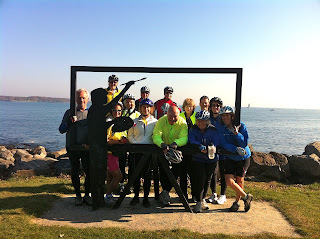 Along the way we will stop at Rye Harbor State Park, O'Diorne State Park, Fort Constitution, ... Since we have experience with afternoon headwinds on the coast, I have mapped out an inland route on the way back if necessary. The route is about 31 miles and mostly flat. Here is a route map. Its all on road, so I plan to bring my road bike. 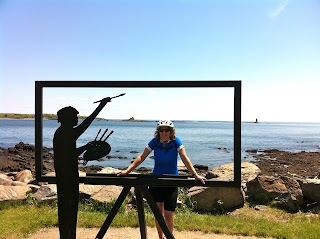 I promise not to ride as fast as I did on the Seacoast Century. AR Index is roughly equal to 31 flat, smooth miles. Lunch on the deck overlooking Portsmouth Harbor at River House Restaurant. Pub lunch with fresh microbrew beer at the Portsmouth Brewery. Lighter fare at Popovers on the sidewalk in bustling Market Square. At 9:00 AM - Meet at Shaw's to carpool. At 10:00 AM - Meet at Hampton North Beach parking lot. At 12:30 PM ish - We will have lunch. 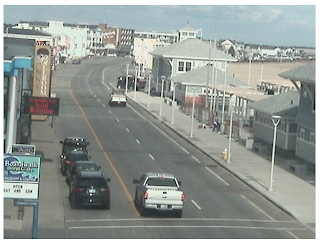 At 3:00 PM - We will be back to Hampton North Beach.